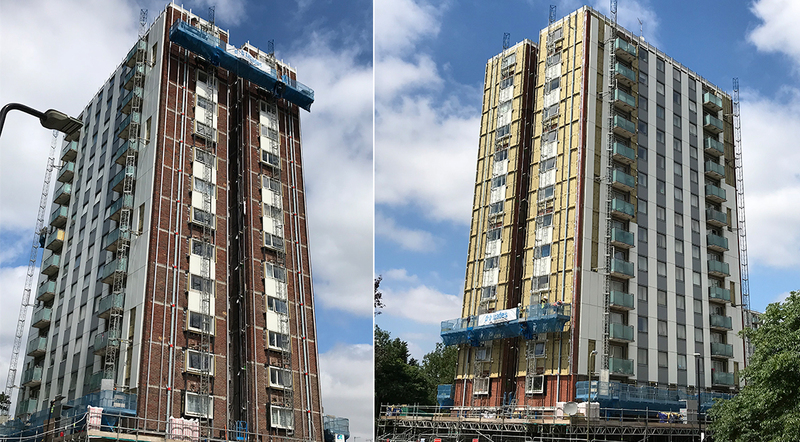 d+b facades are ahead of target to complete the re-clad of 3No Tower Blocks. 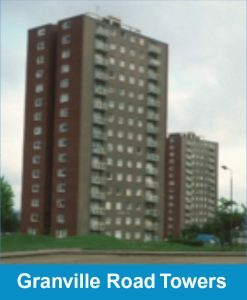 Originally constructed in 1963, the 3No x 15 storey Granville Road Towers were overclad with an ACM system in 2010/11. Following concerns about its combustibility a decision was reached to remove the cladding system in June 2017. 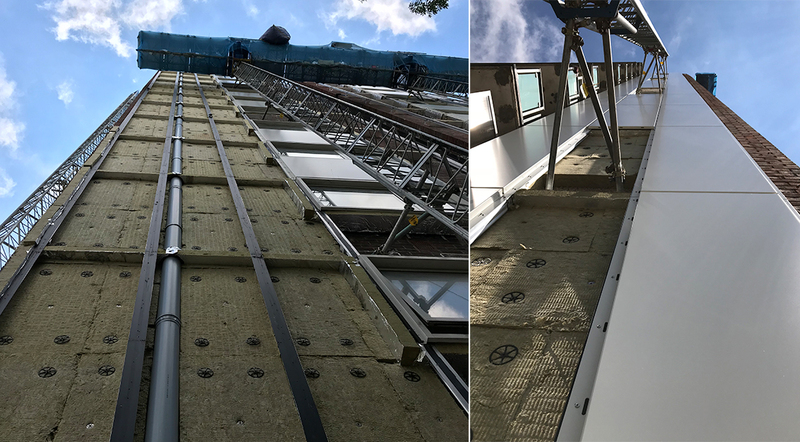 Barnet Homes engaged a contractor to remove the ACM system and this work was completed by October 2017. 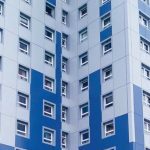 Barnet Homes and Pellings, its Employer’s Agent, sought industry wide proposals for the design and installation of a replacement cladding system. After careful evaluation, they appointed d+b facades to carry out the 1st phase ‘pre-construction services’ which entailed the detailed survey and testing of the existing ‘de-clad’ buildings, followed by the preparation of full proposals including designs, calculations, risk and method statements, samples and prototypes, that would constitute formal Contractors Proposals (CP’s). 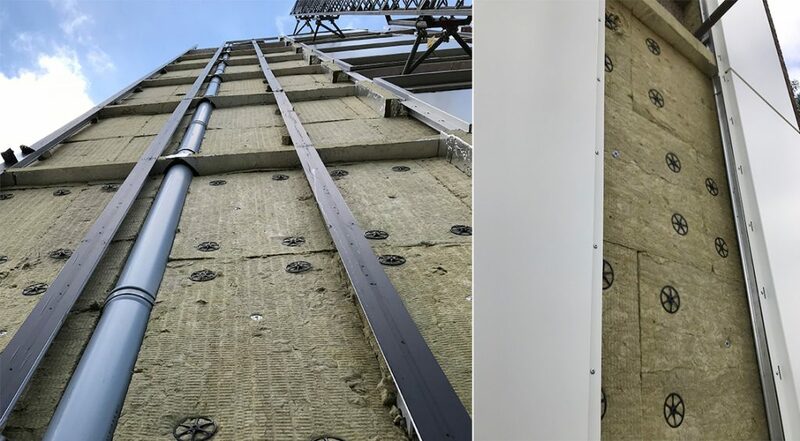 The proposed system used only non-combustible materials together with full-fill mineral wool cavity barriers. After obtaining all necessary consents and approvals, and only when all parties were fully satisfied was the order was placed for the 2nd phase of ‘construction’ on 20th April 2018. The project is now in week 11 of 22 to complete all 3 blocks, 10 weeks ahead of schedule, generating substantial savings for Barnet Homes and reducing the period of disruption for residents. 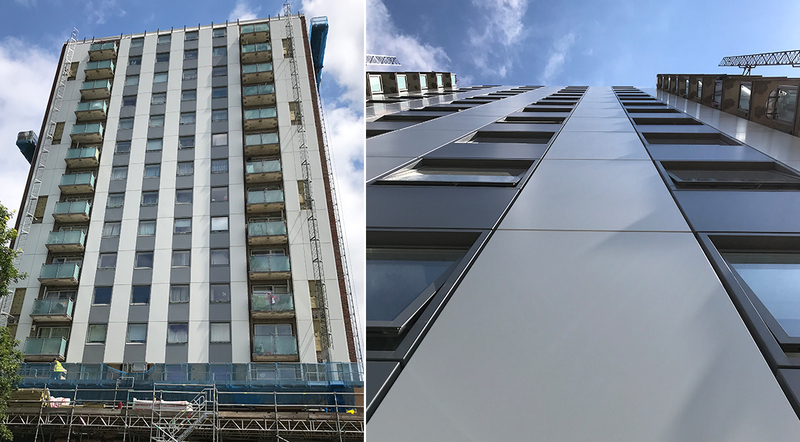 “Barnet Homes has been delighted with the progress of the recladding works to date and looks forward to the project’s completion. d+b facades’ solutions orientated approach through the design stage, contract mobilisation and works has been most welcomed. “d+b have performed extremely well in delivering Barnet Homes’ requirements, whilst also being able to adapt their system accordingly in order to be compatible with the retained elements. We have found d+b to be very proactive on all aspects of the delivery, and they are willing and prepared to accommodate Barnet Homes’ changes and suggestions”. Cliff Woodhouse E: cliff@dbfacades.com T: 07894 256471.